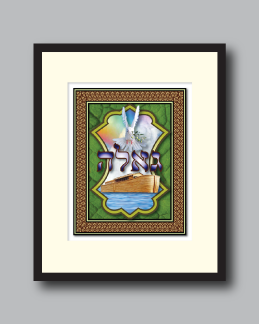 The inspiration for “Redemption” (גאלה) comes from the lessons learned from of the story of Noah found in the book of Genesis in the Old Testament. In the story, G-d floods the earth for 40 days and 40 nights to rid the planet of evil-doers. Noah and his family are the sole human survivors and are given the task to save pairs of all living creatures. With the waters of the flood, the world is washed clean and human existence starts anew. The background is a luscious green leaf pattern indicating growth and new vegetation. The opening within the background is the expansive sky after the storm. 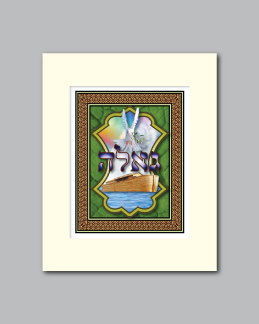 A rainbow, the symbol of G-d’s life affirming covenant with our people, is the backdrop to the majestic ark that held Noah, his family and all the other living creatures. 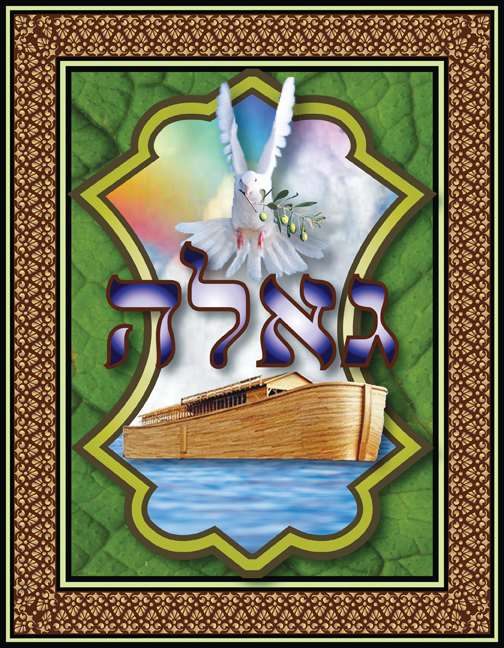 A dove clutches an olive branch to bring the sign to Noah that the flood waters have receded and new life can begin.